Released: 1989. Genre: 2D Platformer; Adventure. Other versions: SPC; C64; CPC; AST; NES. Strange to think that with the enigmatic egg’s popularity during the halcyon days of the eight and 16-bit era I completely missed out on Dizzy’s particular brand of platforming and puzzling. Apart from one session on Magicland Dizzy where the one-touch kill difficulty was more than my tiny little 11 year-old brain could take (to which a snapped zip-stick on the bedroom floor can testify), I’ve never properly tangled with Dizzy. Presumably getting my arse handed to me regularly by Super Nashwan was punishment enough back in the day. Luckily, Chris’s recent foray into Dizzyhood for the TPE has given me a good excuse to give at least one of Dizzy’s adventures a right thorough going over. 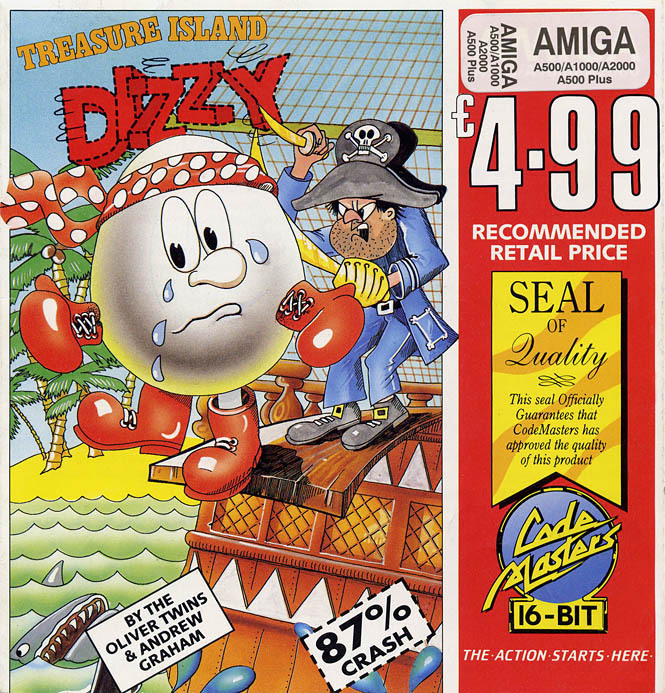 Treasure Island Dizzy for the trusty Amiga was the chosen title. And it’s ever so slightly mediocre. True to the original’s form, Treasure Island Dizzy is not really a platform game in the traditional Mario or SuperFrog sense; it’s more languid and slower paced than that. There’s less dodging of goombas or leaping pixel-perfect jumps in a frantic race against time and much more surveying of the gaming area and identifying how the random items found on the island interact with the local environment. It’s a puzzle game at heart, even more so than the original Dizzy game, with a few instant-death features thrown in to keep the player on their toes. Luckily, the puzzle elements typically have a logical design or handy hints to help the player progress. For instance, the sign indicating ‘blast area’ is a handy acknowledgement that the wall ahead needs to be removed with something a tad eggsplosive. There are also some good graphical markers that stand-out from the otherwise static backdrops. It’s really not that difficult to identify where the 10 tonne weight Dizzy has picked up needs to be utilised. Furthermore, certain death sequences actually have a purposeful existence, typically highlighting that a particular item needs to be equipped in order to make further progress. Jumping in the sea means Dizzy instantly drowns (presumably because he’s from the Chow Yun-Fat school of hard boiled and, therefore, does not float) so one refrains from making that mistake again until an item which allows Dizzy to breath underwater can be located. Indeed the instant death one-life only concerns are a largely over-egged issue. There are few enemies to dodge throughout; those you do need to bypass are not exactly challenging opposition – you can wait all day to avoid jellyfish yo-yoing up and down in the ocean segments; and, whilst a scattering of traps may get you first time round you’d have to be a right egg-cup for these to remain a persistent problem, even with some dodgy controls that mean Dizzy’s rolling mechanism reacts poorly when it comes to stopping. Only some burning torches late on (which you would presume are just a backdrop) provide the one largely unfair and unexpected punishment that sends the player whimpering back to the beginning of the game. So there’s some decent gaming to be had here. Up to a point. The main issue with Treasure Island Dizzy, however, is that the game mechanics become little more than a ritual of trial and error. Nearly all the puzzles can be solved rather neatly, although a couple are likely to prove frustrating. Where to use that blasted axe proves nigh-on annoying! Additionally, some of the platforming is easily bypassed. It’s not quite obvious that the clouds are accessible features for Dizzy to jump on and wander around, meaning some items can be easily missed causing unnecessary head-scratching. But these are small niggles compared to the coin collecting that reduces gameplay to an eggsercise in pure frustration. 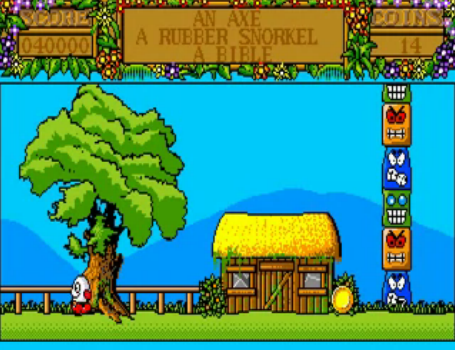 Thirty coins are required to escape the island and complete the game and whilst many of the 30 coins required are easy to collect - because they are out in the open for anyone with eyes to see - more than enough are hidden behind backdrops with no in-game clues provided to acknowledge their eggsistence. By the end of the game players are likely to be routinely clicking on every square inch of the gaming area in an attempt to find those last few precious coins; that is if they haven’t already given up to play something less broken. Furthermore, some of the coins are located in highly obtuse places that only a bit of luck (particularly colliding with enemies) will reveal. Which is just bobbins frankly. Unfortunately, trial and error + perma-death = this isn’t really fair for us players is it? While it certainly increases longevity of what is essentially a half-hour game from start to finish, constant wandering around aimlessly hoping beyond hope that your next click will reveal one of those still-missing coins is not eggsactly fulfilling. Put it this way, Dizzy is no Head Over Heels in this regard, which pretty much nailed puzzling and platforming on home computers without ever making the player feel cheated. If you failed, it was because you were an idiot that had just done something idiotic. Treasure Island Dizzy makes you feel inept albeit through no thought of your own. 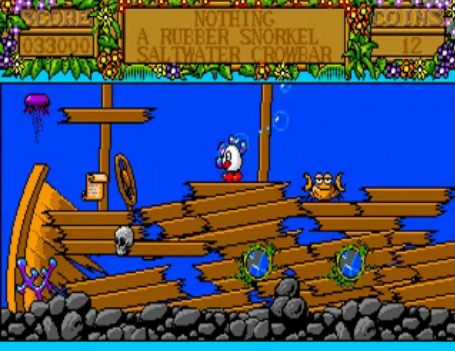 The Amiga version of Treasure Island Dizzy is not exactly the best looking Amiga title ever released either. 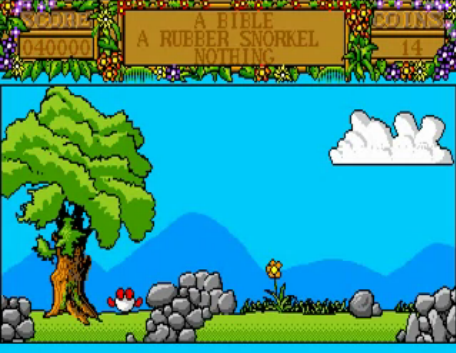 The flick screen nature vastly under-uses the Amiga’s power and whilst colourful, it manages to be dull and plain at the same time. The theme tune is catchy at first but slowly descends into irritating and then highly-annoying drivel, although this might be a causal effect of the game dragging on as you still look to find that last blinking coin. Controls are also a little ropey. Dizzy responds like a slack-jawed sloth to directional input which can be a right pain. The inventory design is also a bit of a fickle nuisance where keyboard input would have been more useful than scrolling through the items carried (and potentially dropping them when you don’t want to i.e. the snorkel when underwater, instant death, eek!) with the single joystick button. It all just adds to the largely underwhelming nature of the game. So, my first true experience of Dizzy; uhm… I can’t help thinking, in some way that eleven year-old fantastic me was actually not far off being right. Sorry Chris. And sorry for all the egg-related puns; eleven year-old me told me to do it.